There are two basic types of DMR calls your transceiver can transmit or receive: private and group. The openSPOT2 forwards what it receives from your radio to the network, or from the network to your radio. The network may forward your calls to it&apos;s other connected stations (hotspots/repeaters/gateways) or calls from other connected stations to you based on linked talkgroups and reflectors. Talkgroups and reflectors are network features, they are completely handled by the network and not the openSPOT2, and their behavior may be different on each network. DMR networks usually have static or dynamic linking available for a talkgroup. Statically linked TGs remain linked all the time, dynamically linked TGs stay linked for you only for a limited amount of time after the last call (usually 15 minutes on BrandMeister, depending on the currently used server&apos;s configuration). 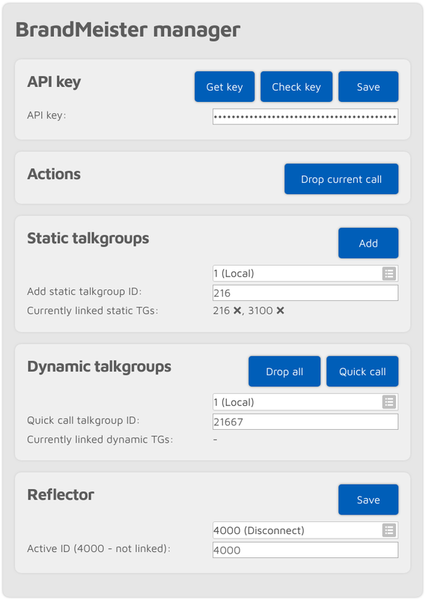 Having a talkgroup linked either dynamically or statically means that stations which have the same linked talkgroup will receive all (usually group) calls sent to that talkgroup. You can link a TG dynamically by simply starting a (group) call to the talkgroup ID. The network will automatically link your openSPOT2 to the called TG ID. To unlink all dynamically linked talkgroups, call TG4000 (start a short group call to DMR ID 4000). Note: calling TG4000 will also unlink linked reflectors, not just all dynamic talkgroups. The BrandMeister Network lets you call any talkgroup ID and will create that talkgroup dynamically for you. There&apos;s BrandMeister Network feature for hotspots called auto static talkgroups: the first talkgroup ID you call after calling TG4000 will be linked auto static which means it won&apos;t be unlinked after a timeout. You can unlink this auto static TG by calling TG4000. Statically linked TGs can be configured on the BrandMeister Network&apos;s dashboard after logging in, or by using the openSPOT2&apos;s BrandMeister Manager. You can define what TGs to link statically at the DMRplus options section at the bottom of the Homebrew/MMDVM connector settings page. Reflector IDs are between DMR ID 4000 and 5000. To link a reflector, start a short private call to the reflector ID. To unlink the reflector, start a short private call to DMR ID 4000. Only 1 reflector can be linked at a time. To talk on the linked reflector, send your calls to DMR ID 9 with a group call (TG9). You&apos;ll receive all calls from the reflector also to TG9. Reflector usage is deprecated (and nowadays mostly disabled) on BrandMeister servers. Use talkgroups instead. Avoid statically linking talkgroups and only use one auto static talkgroup at a time. 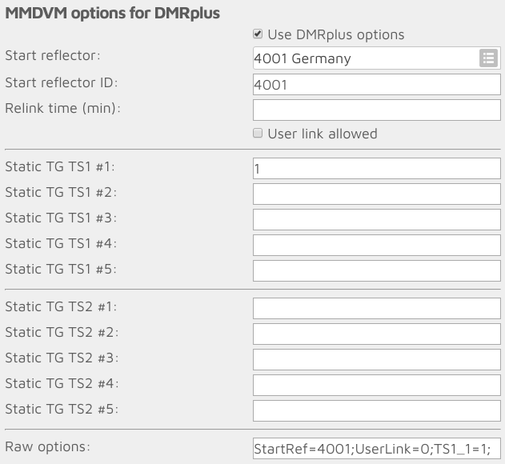 Define what TGs to link statically at the DMRplus options section at the bottom of the Homebrew/MMDVM connector settings page. To unlink the currently linked module, call DMR ID 4000. To connect to module A, call DMR ID 4001, for module B call DMR ID 4002 and so on. You have an RX group list with TG969 in it and this RX group list is assigned to the currently active channel.